Every so often on this blog I like to post a funny or satirize story. Today the state of Texas decided to save me the effort. The Texas Department of Transportation is suing over the titles of a romance novel. The suit names Hachette , Barnes & Noble, and the author of said book, Christie Craig. Their offense? 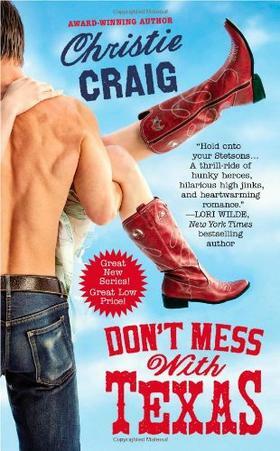 The title of the romance novel is Don't Mess With Texas, and apparently the TxDOT hold the trademark for that term. It sounds like the TxDOT use that catchphrase to sell clothing and other stuff, and they don't want their valuable trademark sullied by a trashy romance novel. I don't know about you, but I'm a little concerned. Do you think with affect my upcoming romance novel The Big Easy?I'm not sure New Orleans will be pleased. I didn’t think you could sue over book titles..
Don’t Mess With Texas has been in use for 25 years to promote keeping our state clean – in ad campaigns on television, radio, and in print. It’s not so much for selling T-shirts as it is for putting on things like car trash bags, hitching citizen pride to citizen responsibility. I think that’s a good thing, don’t you? The program’s on the net, too, and if you google, this is what you’ll find: http://dontmesswithtexas.org/ . But I would also argue that the trademark has been diluted already. I didn’t know it as anything other than a cute catchphrase, and I doubt that anyone outside of Texas does either. They used to put up “Don’t Mess with Texas” signs all over as part of the anti-littering campaign. But people driving through the state didn’t know about the campaign and just figured it was something people said. And most Texans just liked the ring of it. So now, the TDOT has sent over 20 cease-and-desist letters to different companies about it, trying to reclaim the original meaning. Might have worked if they’d done it 10 years ago. I would have thought that the tourism department put the signs up. It’s a catchy phrase. “Texas” is probably just the protagonist’s name. It is, actually. That added a little extra to the humor. This will allow Governor Perry to boast that he has created some more new jobs — for more lawyers — so clearly he and Michelle Bachmann are the people to elect in 2012: The Texan who creates jobs.